As we head into summer, there’s nothing better than soaking up a few rays in the back garden with a cool beer (if we’re lucky that is – it’s Scotland remember!). And, you’d be hard-pushed to find a better place to park your posterior than on a hand-crafted Adirondack Chair. Not familiar with the Adirondack Chair? Visit Sharp Apps new website for sunshinechairs.co.uk and you’ll soon see what you’re missing. 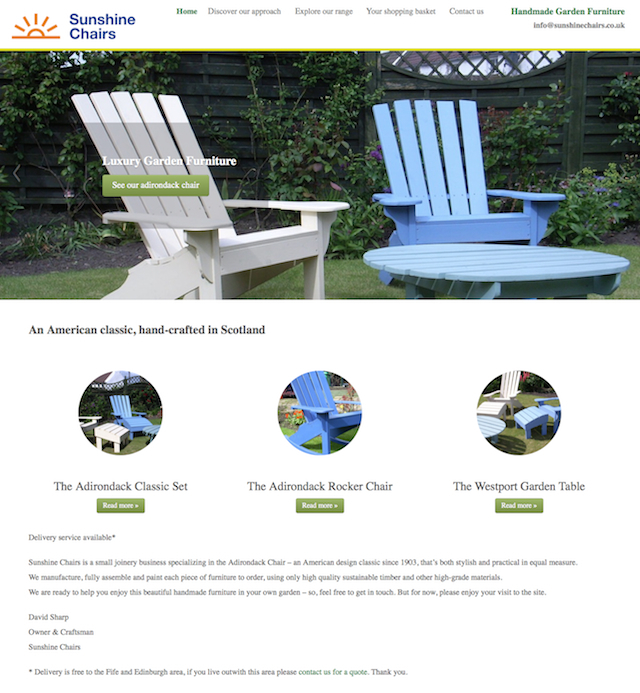 We created this neat little site to help this small craft company, promote its beautiful hand-crafted Adirondack inspired garden furniture. And we think it looks fab. Run by a retired tradesman, Sunshine is more a labour of love than a big bucks affair. But no matter what size the budget, Sharp Apps can design and build a digital solution that does the business – and in good time, We don’t do sitting down on the job (but if we did, it would be on a Sunshine Chair! ).